In my research for writing my own memoir, I’ve been doing a lot of research on the genre. I’ve been reading non-fiction guides in addition to reading actual memoirs to get a feel for format and style. I heard that this book was really good but my first thought was “A book about a rich movie star complaining about her life? WAH!” I wasn’t really looking forward to reading it and intended on just skimming to study the format. I read the first chapter and was immediately sucked in. I had no idea what the book was going to be about and I was blown away by the subject matter, her brutal honesty and the crisp, eloquent writing style. Portia de Rossi started her career in Australia at 12 years old when she started modeling. This was also the beginning of her eating disorder. She taught herself how to binge and purge and spent most of her teen and early adult life as an anorexic/bulimic woman striving to weigh nothing. The self-hatred she describes in the beginning chapters are very familiar to me. I was never anorexic or bulimic but I definitely binged and I had a self-loathing opinion about my obese body. The negative self-talk she demonstrates in the book mirrored my own thoughts. The only difference? I actually WAS fat. Portia weighed about 120 pounds and was hardly fat. She was working out to the point of having a deficit of calories every day and when it got to be too much, she’d binge. She describes going out to a Mexican restaurant with her brother and eating an appetizer, an entree, part of her brother’s food, a bucket of chips and salsa plus bottomless margaritas. Then on the way home, she stops at a gas station and gets nachos, a Snickers bar, Cheetos and a bunch of other junk food. She binges on it in the car and then purges. It’s disturbing to see the sickness she describes in such honesty. The disorder grew worse when she joined the cast of Ally McBeal. I was a big fan of Ally McBeal and I remember when “Nelle” joined the cast. As a teen I remember being blown away by her ice-queen beauty. She was absolutely gorgeous, with what I thought was the perfect body. Who knew she was living a secret hell in real life. She saw a nutritionist in LA to lose weight. The nutritionist instructed her to eat 1400 calories a day and gave her a food list. She ignored it and ate 1,000 calories or less. She had two food journals: the real one and the fake one she showed the nutritionist. That quote made me think of Madonna and I wonder if she has an eating disorder? 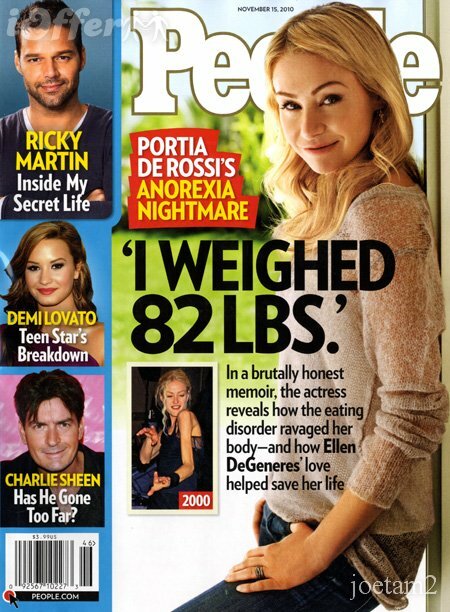 Portia eventually got down to 82 pounds and collapsed on the set of a movie. “I am tumbling now. I have fallen off my axis. I’m spinning into the blackness. The spinning suddenly stops. I have escaped. 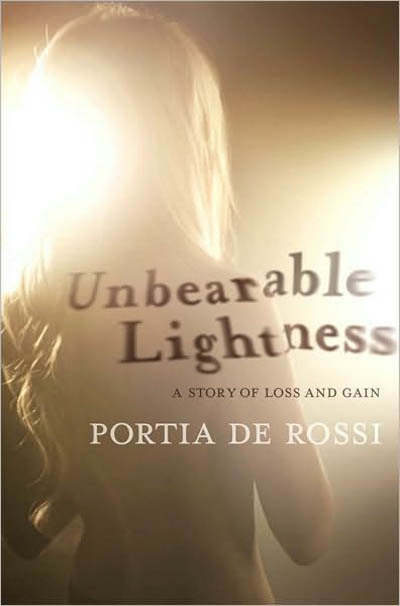 [pg 259]” The part in the book where she finally collapses brought tears to my eyes. Heartbreaking. She weighed less than 100 pounds. She hadn’t had her period in over a year. She developed osteoporosis. She doesn’t really mention her relationship with Ellen until the Epilogue of the book. She does discuss being gay throughout the book but in hiding. She was terrified of people finding out–of paparazzi discovering her secret, of Hollywood ostracizing her. It was really devastating to read how much of her life was a SECRET. Homosexuality was a shameful secret. Anorexia was a shameful secret. Eating was a shameful secret. Just brutal to read, but I think gay or straight anyone can relate to her book. Wow, I hadn’t intended on writing a huge long post about this book but it seriously touched me in a way I wasn’t expecting. I could relate to the negative things she told herself about her body. I could relate to the slippery slope of too much exercise. I went through something similar when I was getting obsessed with the scale (which is why I made a rule to only weigh myself once a month). I’m glad that I was able to step back and see that I was nearing a dangerous zone with my thinking and correct the behavior. It’s not always easy, like Portia describes. The book is wonderful. I read it in one day. It’s an easy read, yet a hard subject to read about. I really cannot recommend this book enough. QUESTION: Are you going to read this book? Could you relate to any of the quotes? I saw her on Oprah when the book first came out and it was a great interview. I’ll have to get the book. Things are never as they appear. I always try to remember that…you can never know what someone else is going through just by their outward appearance or what you “think” you know of them. p.s. I bought my husband a Hipcooks gift certificate after reading your review last September. We finally used it last night and it was so much fun! Apparently they don’t really advertise so I don’t know that I would have heard about it except through your blog, so thank you! I wish I had seen her on Oprah. I don’t even remember hearing a buzz when this book first came out. The only reason I got the book at the library was because Howard Stern talked about the book and said it was really, really good. I was curious and gave it a try. I’m glad I did. That is so cool that you did Hipcooks! It was SUCH a fun night. I’d love to do it again. What lesson did you take? We did Healthy, Fresh, and Zingy 3. It wouldn’t have been my first choice but it turned out fabulous! I thought it was interesting in the interview that she said she and Ellen started dating at her heaviest weight ever. Although still beautiful, definitely not at her fighting weight, she found true love. I like when that happens…when you realize your inner person is so much more than your outer shell. We too often manage to forget that…even though it’s hard to admit. I liked that part too. When I met Michael I was about 30 pounds heavier. I’m glad he was able to see passed that and see the real me. Not every guy can. Wow I had no idea she struggled so much! that photo of her with those veiny arms is scary and sad… I had a roommate in college who would do that with gum every day… chew an entire pack one piece at a time until it was all gone. It made me so sad to see someone in such an unhealthy cycle! The veiny arms are definitely scary. I have this on my “to read” list. I loved her in Ally McBeal and I love her with Ellen. Some of those quotes are crazy! I think it is going to be an emotionally challenging book for me to get through. It was emotionally challenging but worth the heartache to read it. The insight into her disorder really opened my eyes to the struggle that people have with Eating Disorders. After getting so many comments about how I look pregnant, when I’m not pregnant at all, I did consider going on a crash diet of some kind. But I’m resisting the temptation, because I know I would get sick very quickly. The fact that anyone can last more than a few days eating and living like that is beyond me. I’m so sensitive when it comes to my body’s nutrition, a day without the right amount of calories and nutrients and I’m sick, dizzy and moody as hell. I wondered the same think Jennifer! How could she live like that for years? Your review is crisp and to-the-point. It takes a lot of courage to put down your innermost fears and struggles down in print and to share it with the world. You risk re-opening old wounds and revisiting all the dark places. Everyone has their own viewpoint and a ‘lens’ through which they view the world..Portia’s was just very different. I hardly read memoirs-but this one was worth it. I wish I could tell Portia somehow as to how brave she is-and she’s ‘more than enough’-she’s ‘as good as she was meant to be’. The only one who can truly help you is you yourself-that’s the message i want to spread to the world.